Leaping Reindeer Cookies; Sure to dash away! Dash away! Dash away! Dash away all! 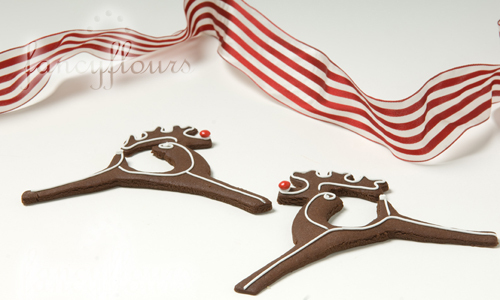 These whimsical leaping reindeer shapes are sure dash right off the cookie tray! Perfect for a child school party or for unique and yummy table favors at your holiday get-together. We decorated these shapes with simple lines of royal icing and a red sugar pearl for the nose. Try the Fancy Flours Chocolate Gingerbread Recipe for a treat that is sure to become a holiday favorite. These are the cutest and look easy! I will add these to my cookie list! I have been looking on all blogs, including yours, for tips on how to coat sugar/ginger cookies with tinted white chocolate instead of royal icing. The cookies at Duane Street Patisserie in NYC are decorated in this way and they are fantastic. I tried using your white chocolate but could not get to the right consistency. Advice? Hints? Sue L, That sounds good.. I do Snowflakes and that would be a fun twist. I tried the chocolate gingerbread recipe, and I used the precise ingredients stated and baked them for 13 minutes. The cookies turned out hard as rocks. And on some of them, the surface of the cookie was cracked. What did I do wrong? I used crisco in this recipe instead of butter which I usually use for my cut-out sugar cookies….is this the problem? My dough is very dry. Did I do something wrong or is this the normal consistancy?